How "A Solid Gold Sound" out of Buffalo, NY Ruined Our Wedding Reception! 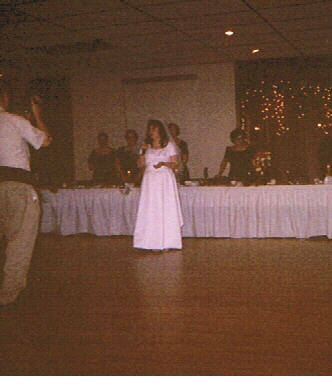 Here is the picture of my wife announcing to the guests that the Disc Jockey didn't show up! The Disc Jockey had been under contract for 10 months and paid in full for 9 months. "1. We provide a trained, adult, professional DJ and/or Videographer in appropriate attire who arrives on time." Not only didn't the DJ show up "on time", he didn't show up at all. The videographer did arrive on time, however, his idea of "appropriate attire" and mine are two different things. His appearance reminded me of "Columbo" on TV... disheveled with questionable personal grooming habits. "3. All your phone calls will be answered LIVE (no answering machines), or returned promptly if after business hours." We were given an "emergency number" with which to call if we had any problems over the weekend at our reception. When we realized that we had NO DJ, we called that number repeatedly. This was at approximately 7:30 Saturday night. The answering machine that the number reached promised that we would hear from them "within 15 minutes". We heard from NO ONE until about 3:00 pm Monday afternoon. "10. Unless YOU cancel, Nothing-No accident, sickness, weather or other acts of God or negligence, Nothing relieves A Solid Gold Sound of it's obligation to fulfill this contract by performing at your event. Nothing." By now it should be obvious to everyone reading this... A Solid Gold Sound's Guarantee isn't worth the paper it is printed on. Don't be fooled like we were and have your special day ruined by this company! Instead of having a happy bride at our wedding reception, my wife spent most of the night in the lady's room crying. As of this date, 11/16/04, we have received neither an explanation of WHY their DJ did not show up nor a formal apology from A Solid Gold Sound. They did send us a check for the services that they failed to provide but it IN NO WAY is it adequate compensation for the total lack of regard they showed towards us and the anguish my wife suffered by having her wedding reception ruined. DO NOT TRUST A SOLID GOLD SOUND!